I started to look for a hatchback to suit my wife's new acquired interest of owning and driving her own car.Initially i tried to convince her to buy a Nano(Sunshine Yellow) but she reasoned that it would be better to acquire an used car and carry out all the possible damage on it and then graduate to a new car all togather.Sounded logical. 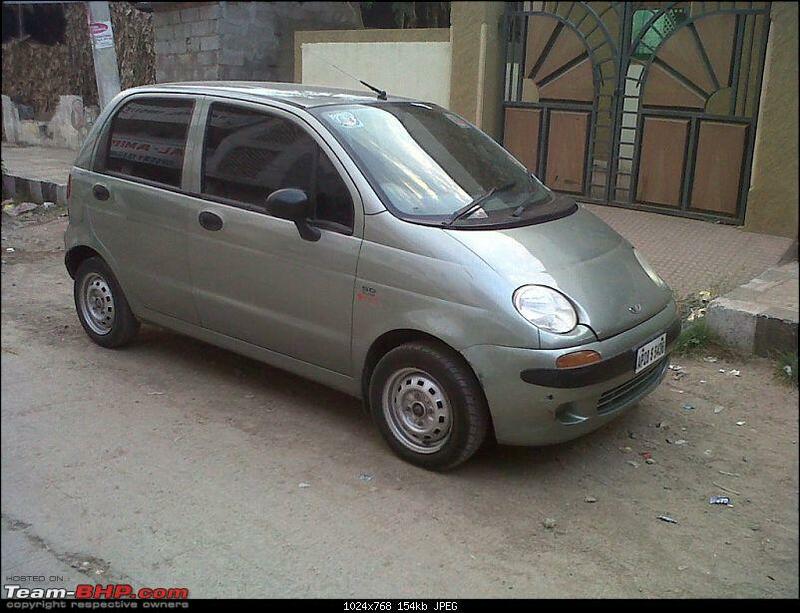 Hunt began a week ago going through the newspaper ads,local agents,internet classifieds(including Team BHP).Yesterday i came across a Daewoo Matiz,which enticed me. 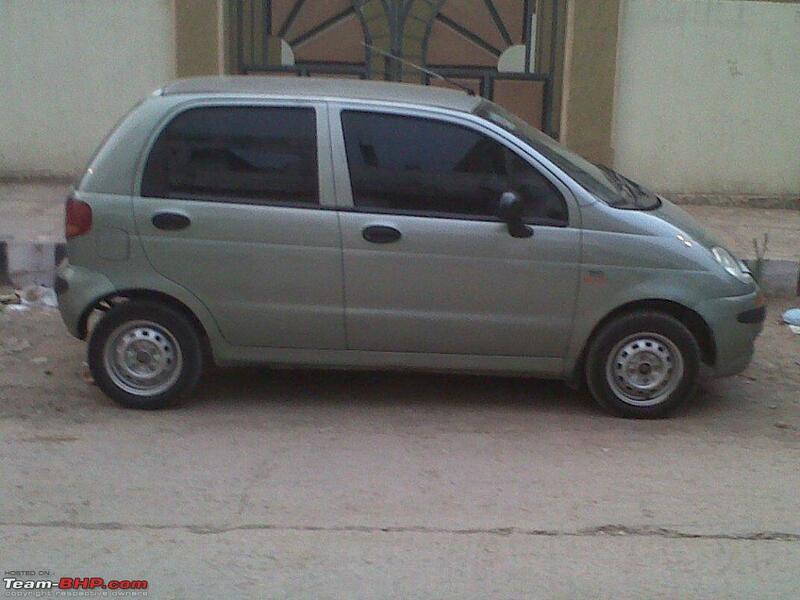 - 2002 Manufactured by Daewoo Motors. - 796 cc , 3 Cylinder Petrol Engine. - 5 Forward Gears , 1 reverse. - InDash DVD Player (thrown in by the seller as a compliment). - Brand New MRF Zigma 13" tyres. I particularly liked the Engine bay,which was small and had components neatly packed. 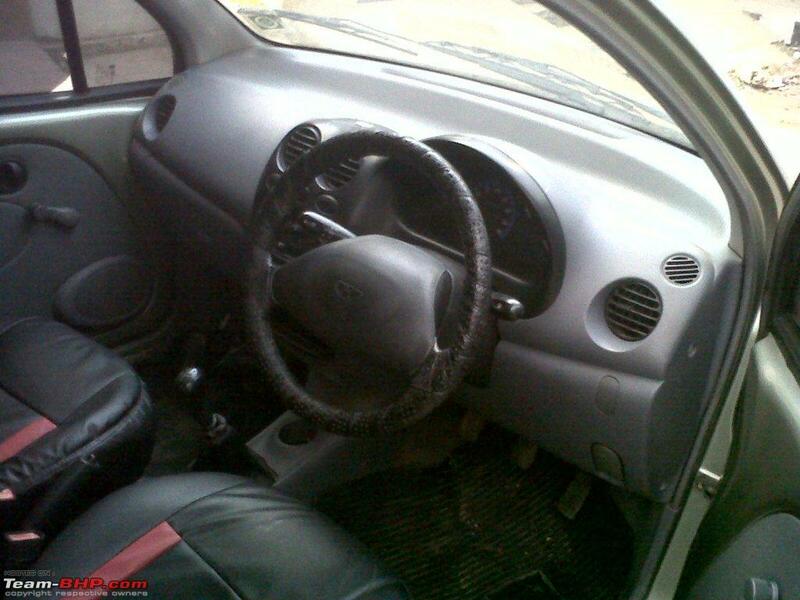 Any Matiz owners can give me few tips to run this car effectivly. Last edited by hillram : 19th April 2011 at 14:12. Right now the Charming Matiz is undergoing a new paint job.Though at first i decided to just to a patch work of the dents,somehow this wasnt my usual way of restoring.This car needs a new paint job all togather. Last night did a short drive on the Expressway and found that the handling of the car is superb.Sharp turns could be done at high speeds. 3.Aircon is simply chilling even in torrid Hyderabad climate. 5.Finally i like the headlights i.e 2 small moons showing the way !!! 1.No clock placed on Dashboard or any part of the speedo console...have to fix an after market one. Im now scanning through the shade cards to look for a nice feminie colour as it will be driven by my wife.Suggestions are welcome and watch this space for updates..a bit patiently !!! the ad caught my eye too, good price the person was quoting. why not wait for a couple of months before getting it repainted or touched up? looks in good shape, guess it just needs a through service and a proper clean up. good pick there. It looks really well maintained. Well the stable keeps growing! Thanks Aadithya.Charmee (as its called now by my wife) has few dents and i certainly want my wife to have a nicely painted car,even if she bashes up,i will get it repainted again.Mind you,I will also take few rides in it timeto time. Its well serviced already and just needs an interior polishing and shining. Last edited by hillram : 21st April 2011 at 19:55.
may i suggest a bright red color and a set of classic five spoke silver alloy wheels? should look amazing in that setup! what other changes are you planning on? IIRC, the Matiz was awarded the most comfortable or practical hatch in its segment, sometime in '01 by an Auto Magazine. And regarding the clock, even cars from a segment higher didn't have clock's at that time. btw, if its OK with you, could you mention the price which you bought her?. If you don't mind, how did you purchase her for? Congratulations hillram for your wife's "Charming" Daewoo Matiz. One of my relative used to own 2001 yellow matiz. I too remember the AC was quite chilling in Faridabad heat. The car requires some good waxing/polishing job and she is all set to roar. What is the mileage and how the engine sounds? Congrats Mr Ram! I admire your "collection" of cars. Congrats on the 'new' add. As Dhanus says how much did you get it for? I've always wanted to own (heck! travel!) in a daewoo, and I think I can soon, thanks to its resale value. Daewoos have always been a value for money proportion. Great cars. Small money. EDIT: I don't see 'power' windows! FYI. It was once upon a time, the most awarded vehicle worldwide. Last edited by Arkin evoisrevo : 21st April 2011 at 20:38. Not sure if it helps, since I sold mine a few years ago. I remember getting a peanut or two for it. The airconditioner was excellent. Which was a little more than can be said of the engine once the former was turned on. You could either seat five or have the airconditioner on most bridges in Calcutta, not both. I sense trouble in the hills of Hyderabad. Very, very good ride quality and pretty decent plastics. After nine years, you may want new upholstery or floormats. And a new steering wheel cover. Just hygiene, nothing else. 2nd gear 'slightly tight' is like calling someone a little pregnant. It was pretty difficult to get used to. A slight amount of outward pressure (leftwards) when going from 1st is required. For downshift, it takes practice. Idea is to try not let it settle in neutral position or you're hosed. Car should give about 16 in city with A/C. With my trigger-happy driving getting 12 was no problem IIRC. Excellent space in the front and back, but not enough in the boot for a midsize suitcase without folding down the seat. Very easy to get in and out of - older people and ladies will love it. I think you are in the wrong section here, this is a long term ownership report. As someone asked, how much you paid for it because that only justifies whether this example is good or not as Matiz goes for literally junk value these days as most of them have engine problems, I wish you got a good one. 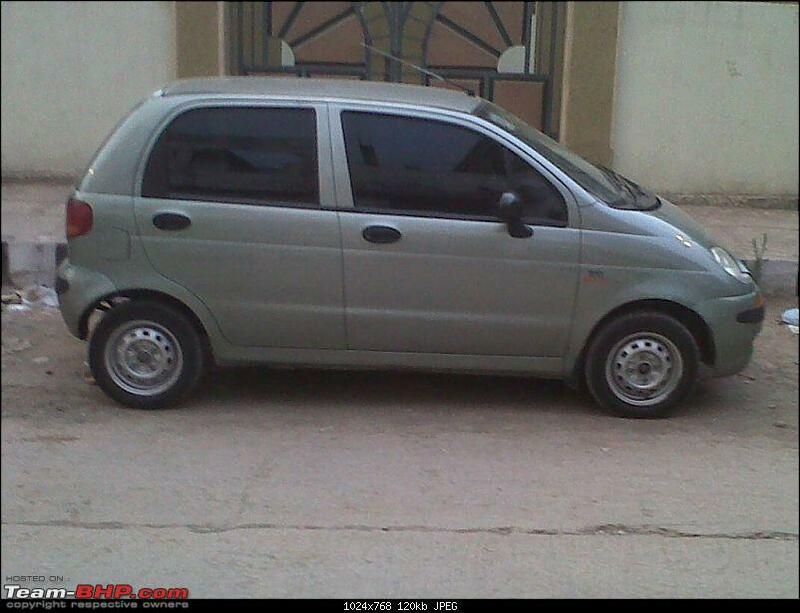 Sorry if I am being pessimistic, but I have 2 friends who burnt their fingers with this car. Yes, it was the cutest car when it came out in 1998 and IIRCC, it also won the same European award in 1998/99. And me too a big fan of the Matiz at that time. Thanks for all your positive,encouraging comments.Indeed I liked this car way back when it was launched. 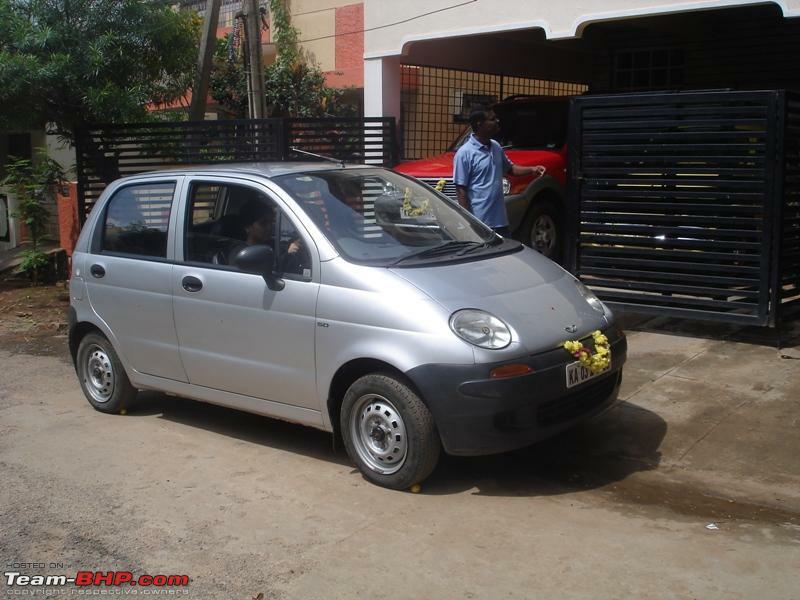 Since everyone have shown interest in the price of the car:I purchased this car for Rs.60,000,which i felt was a great deal,since it was single doctor owned and maintained well and came with a DVD Player and new tyres & Battery. Power Windows have been removed as they were causing a short circuit.Hence removed them and replaced manual ones. @Esteem Lover:The mods have placed this thread here,hence I reckon they know what they are doing,better than us !!! Last edited by hillram : 22nd April 2011 at 02:34. 4) Fantastic Handling and power delivery. 6) Not to forget the SUPER SILENT Engine. All the best to your Matiz. @hillram, that looks a neat specimen. Congrats. The AC is very powerful which acts a bit of dampener on the engine. However, if you master the right gear changing points, there shouldn't be any cause for concern. The post 2001 versions had a better gearing, and so yours should need less adjusting. Primarily, the 3rd gear can't pull at low revs with AC ON, so you have to shift down to 2nd - which as you mentioned is notchy/not smooth. Handling is good due to the front strut brace imparting more rigidity. Its fun to drive on twisty roads once you understand her. FE is high. 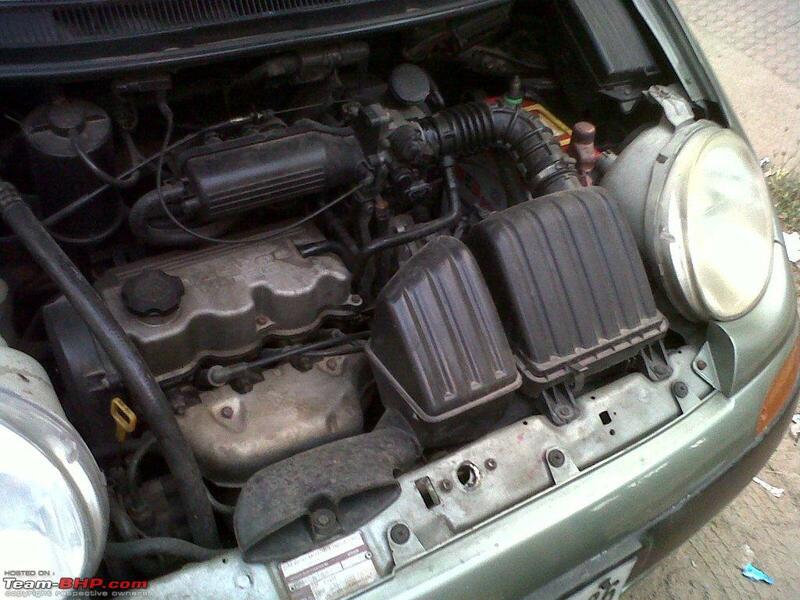 Keep an eye out for 'engine overheating' - happens in some cases (actually a Maruti 800 issue). I believe the AC gas is no longer available (environmental reasons), so that could require replacing AC unit in the future. Also an issue for old Zen etc. Find a good mechanic to do regular servicing and repairs because that's the main downside (atleast in some locations). @pavankadam, to my knowlegde its the other way round. 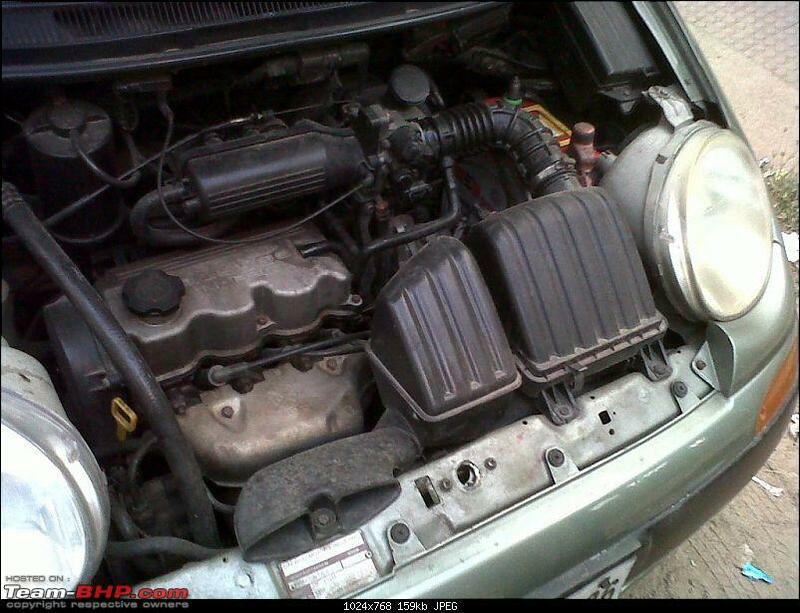 Daewoo licensed the 800cc engine from Suzuki, and they greatly enhanced/tuned it. We had a 1986 "new-style" 800 for 15+ years, and I can say the refinement in the Daewoo engine at idle (and while running) was way superior to the Suzuki! Last edited by lancer_rit : 22nd April 2011 at 10:57.